On day four of the High Sierra Trail, we descended from the top of Chagoopa Plateau all the way down into Kern Canyon and then followed the Kern River up to Junction Meadow with a stop at Kern Hot Springs on the way. This was one of the few days of the trip with a net elevation loss, but don't be fooled - going downhill with a pack on can be just as tiring as going up! The scenery from this day was a refreshing change of pace and provided some nice contrast from the first couple days on the trail. Instead of climbing over and along the tops of sheer mountain ridges, this portion of the trail has you making your way through the Kern River valley. We woke up near the shore of Moraine Lake and were able to see our surroundings for the first time since getting in late last night. The area was very forested, and Moraine Lake looked gorgeous with the morning sun shining on the mountains in the distance. Since we didn't have the energy to pump water the night before, we headed to the shallow shore of the lake to scoop some water for the our gravity filter water system. We got an early start, because we knew these two days between Big Arroyo and Crabtree would be the longest days of the trip since we were trying to pack in the miles and reduce the amount of nights spent in the valleys between the two mountain ranges. Since we were on the Moraine Lake detour, we hiked 1.5 miles before rejoining with the High Sierra Trail near Sky Parlor Meadow. Along the way, we startled several deer grazing near the trail amongst the trees as we walked up on them. We soon found ourselves on the edge of a cliff looking down into Kern Trench, a dramatic and enormous valley. We had lots of switchbacks to make our way down to the bottom, and we had to take several breaks, as the descent was pretty rough on the joints. On our way down, we passed a group of backpackers going up, and I couldn't imagine climbing up such a steep grade with full packs. The trail dropped an intense total of 2,375 feet in 4 miles from Sky Parlor. We took a well-earned break at the junction at the bottom, but we all couldn't completely relax knowing we still had 9.2 miles to go untill Junction Meadow, our destination for the night. Everyone was still pretty spent from yesterday's 14 mile day, but seeing that the hot springs were less than two miles away helped us get back on the trail, eager to soak our aching joints in the warm water. We made a sharp turn and headed north up the Kern River. For 1.8 miles the trail covered a variety of terrains - soft sand along the river bed, rocky scree, flooded marshes, and forests. Eventually we spotted the wood box enclosure by the river that marked Kern Hot Springs! Kern Hot Springs is not like a traditional hot spring that you normally would imagine, but the spot is unique in that there is a simple cement bathtub that is filled by the natural spring. We each took a turn soaking, and the wooden walls provided enough shelter to really enjoy a private bath with views of the valley and the sound of the river in the background. Some kind soul even left a pot to help scoop the warm water over you. At first glance the tub might look questionable for bathing, but trust me, it was the best outdoor shower experience I've ever had. It felt so nice to soak my aching legs and muscles and wash my hair. After our tuna and cracker lunch (click here for my favorite backpacking meals), we kept alternating between icing our legs in the freezing Kern River and the soaking in the warm spring water. It was hard to leave such an idyllic spot, but we still had 8.2 miles to get to Junction Meadow. The trail continues along the eastern bank of the river slowly gaining a total elevation of 1,335 feet from the junction. Even though the valley was quite flat, this was a really hard portion of the trip for me, and I really fell behind the group as the miles packed on. This trip I also learned I'm not the best at river crossings (especially towards the end of the day when I'm tired), as most of the days I had wet boots, socks, and pants from falling in at some point in the day. Ooops. Since there were lots of streams flowing down the side of the mountain into Kern River, we had several river crossings this afternoon, with some more challenging than others. I can imagine these are some of the toughest creek crossings of the trip when the water flow is higher earlier in the season. Whitney Creek at mile 13.4 in particular was one of the bigger creeks to cross. We climbed up about 50 feet along the side of the creek looking for a possible crossing, and we ended up having to return back to the main trail and cross in our river shoes. 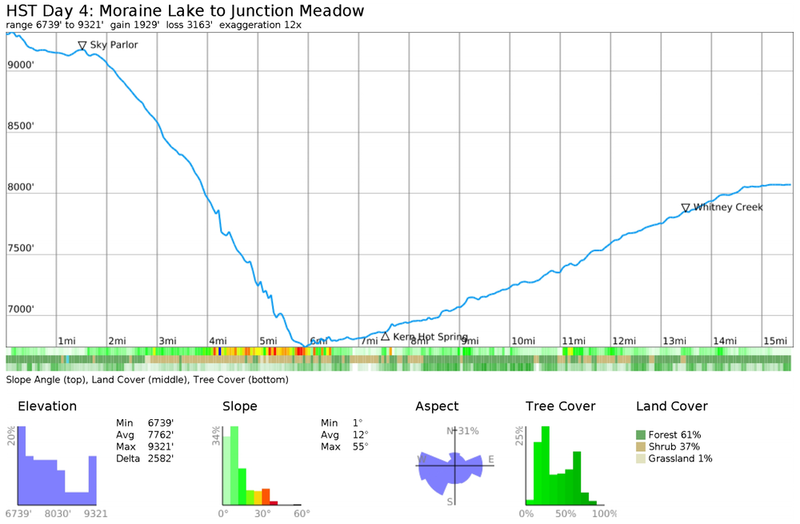 After the final water crossing at Wallace Creek at mile 15.5, we finally made it to Junction Meadow! There was only one other couple camped there, and we picked a site at the other end of campground near the river and bear box. The Junction Meadow campground was situated in a forested area with several tall mountains visible in the background.